The Growing Importance Of Security Systems In The Workplace | Calgary Alarm Inc. There are a number of threats, both external and internal, that can put your business at risk, regardless of whether your business is big or small. Your business is your livelihood, and therefore it makes sense to protect all aspects of it, especially when it comes to security. Many business owners are recognizing the growing importance of security systems, which is why they are becoming increasingly prevalent in the workplace. Here are some of the reasons why it is time to invest in a security system. Businesses are obviously not immune to burglaries, vandalism or theft. The majority of these crimes occur when criminals believe they are going to get away with them. 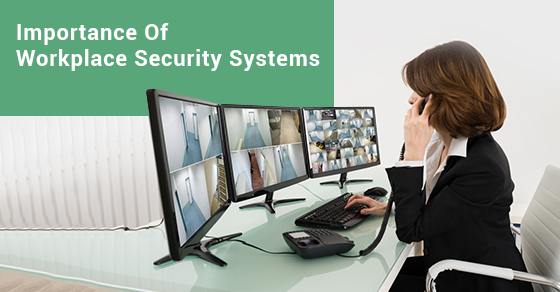 Security systems, however, with the alarms and security cameras that go along with them, have been proven to deter criminal activity. Video surveillance provides a record of all activity, allowing you to be alerted to suspicious activity. Video surveillance also makes it possible for you to monitor less than safe areas of your business such as parking lots, allowing you to make sure that your employees are getting to their vehicles at night. It also protects your employees indirectly in the event that an employee gets harassed while in the workplace. It may be hard to admit, but businesses often experience theft at the hands of their own employees. Just as video surveillance deters outside criminals, it prevents employee theft in much the same way. No discrepancies can occur between your employees and customers if there is video evidence showing exactly what happened. In today’s society, people are often looking for financial gain regardless of the cost, making wrongful lawsuits increasingly common. With video surveillance recording everything that goes on in your place of business, this footage will protect you in the event that you come up against a wrongful lawsuit. An optional but important feature of security systems is access control, which permits certain employees to enter and exit the building via an electronic card. This is essential to the safety of you and your employees because it means that unauthorized people cannot enter your business at will. It also makes it possible for you to restrict employee access to certain parts of the building, which can be very convenient. As one of the best security alarm monitoring companies in Canada, consider Calgary Alarm for your choice of commercial security. Contact us today for more info.